Fleet of German didactic botanic models, papier-mâche, Robert Brendel, 1875-1900. Blythe House, storage for London’s Science Museum. 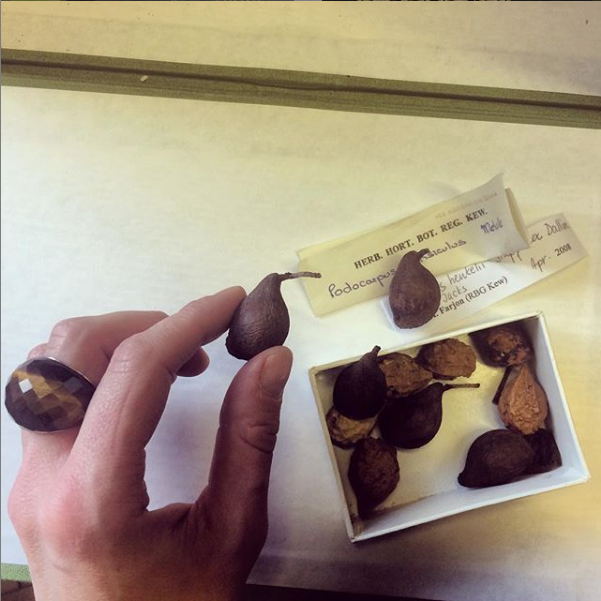 Kew is renovating their breathtaking Temperate House (the largest Victorian glasshouse in the world), and the wonderful interpretation team has commissioned me to photograph seeds & fruits of rare & endangered species, to be displayed on exhibition panels alongside a growing representation of the species. I’ll be photographing at the Herbarium, London, and Millenium Seed Bank, Wakehurst. Come meet the plants & their seeds when the Temperate House reopens in Spring 2018. Jacaranda mimosifolia at the Herbarium in London. I wrote about photography, specimen collecting, personal narrative, and Anna Atkins for INKQ’s second issue. Publisher & botanic illustrator Jessica Shepherd is a dear friend & indefatigable champion of interdisciplinary art & science. Her own agapanthus painting, ‘The Kiss’, is featured, along with work by David Nash and Niki Simpson. Limited edition run, fantastic print quality. Subscribe here. 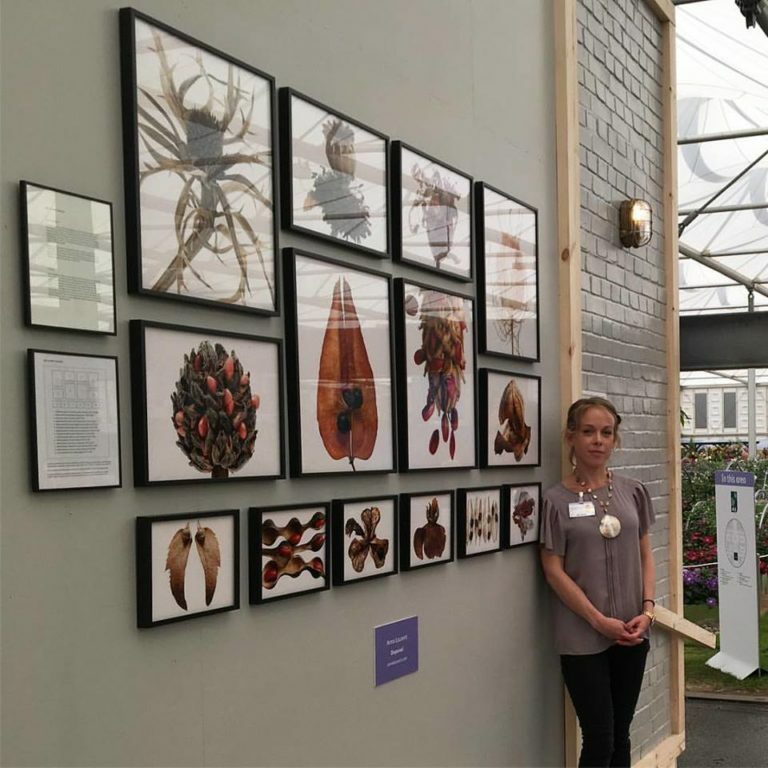 The official opening of Kew’s Temperate House welcomed a speech by Sir David Attenborough and interpretive panels which featured my photography of seeds and fruits from Kew’s carpological collection and seed bank. Iris foetidissima, collected in London. Hydrangea sp., blind contour drawing in Brighton. This morning I presented a proposal for a new project, Dispersal: The Red List, at Kew Gardens, London. Rather than collect from the gardens, I proposed working in the Herbarium, selecting dried fruits and seeds of rare & endangered species. 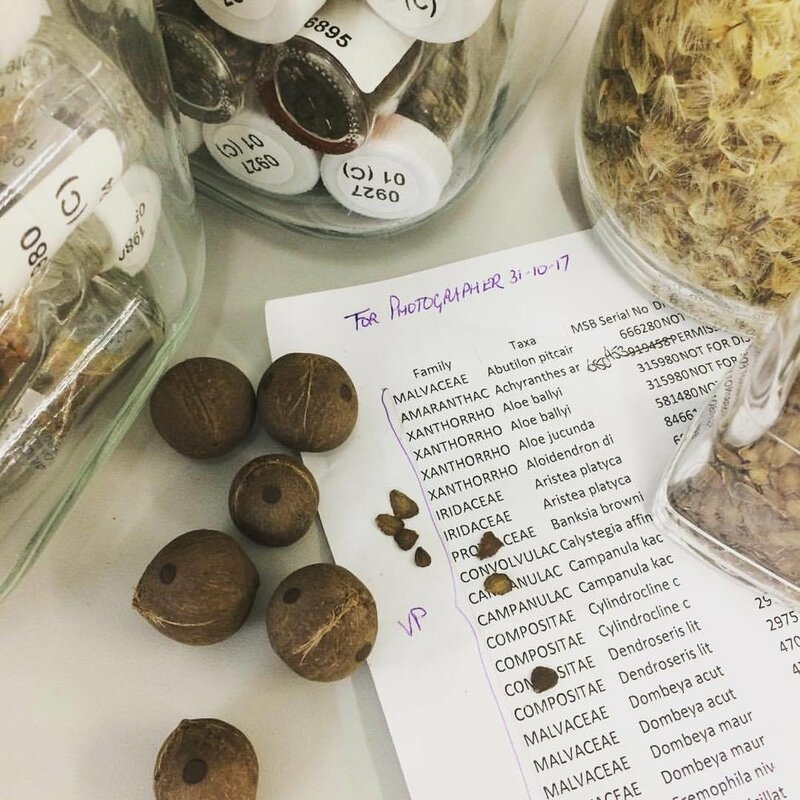 The project will illuminate Kew’s marvelous dried collections & extensive history, meanwhile demonstrate the critical concerns of conservation and species extinction. The Apocynaceae collection, a family exhibiting a rare evolution of dispersal mechanisms. Is there anything more beautiful? Fruits of Landolphia kirkii. Paper clippings for my upcoming art installation ‘The Age of Exploration meets Age of Extinction’ at The Exhibitionist Hotel in South Kensington, London. 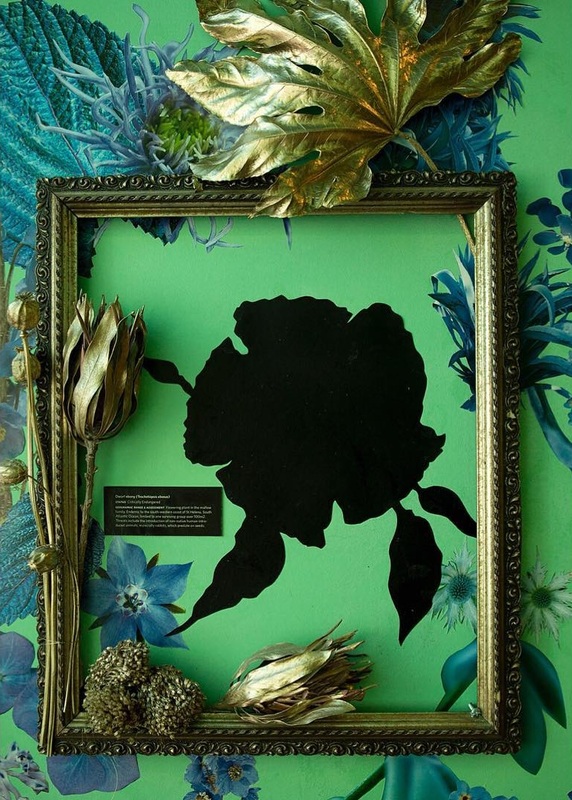 The final piece will profile extinct & endangered flora & will span a small corridor in the hotel. Opening August 2018, hopefully up for a few years. Research for a new book is consuming the walls of my flat. London's Kensington & Chelsea Review, vol. 5 issue 3. Cover feature & interview about the Dispersal project. Thanks to Tani Burns for super PR, Apollinaire Fine Arts for the exhibit, and Coco Kahn for the interview. We are open! 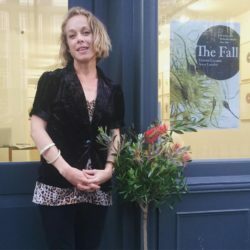 Come see The Fall, 11-28 May, at Fitzrovia Gallery, 139 Whitfield Street, London, W1T 5E. Gallery hours: Wednesday through Sunday, 11am-7pm. Fifty-four of my photographs are exhibited, and we also have a full calendar of evening events. My book lecture is 25 May; panel discussion with Preti Tenata 18 May. I’ve been invited to give a talk about my book at Oxford Botanic Garden in the fall. I visited the library and found a few of my favorite wall charts. 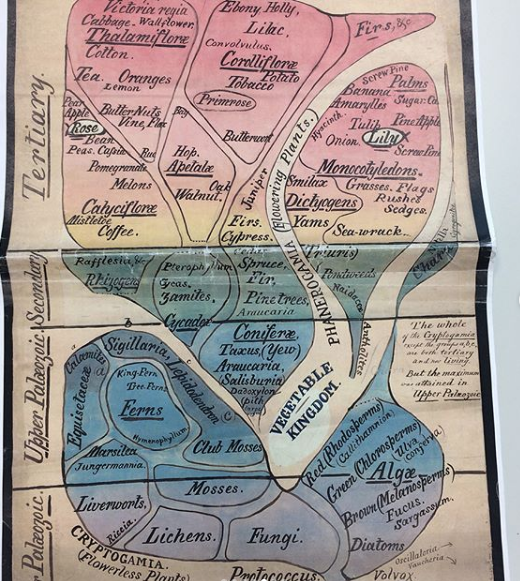 19th century botany professor John Henslow was Darwin’s mentor & questioned Linnaean taxonomy, publishing wall charts that tackled systematic botany. The library has Henslow’s process sketches for the charts. Henslow’s design for the university’s systematic garden. Cedric Morris (1889-1982) was less concerned with a plant’s beauty, more with its “apprehension”, or how it finds its character amongst other competing species, from which charm & character emerge. Morris was an artist & plant lover who painted & gardened in Cornwall, Paris, & Essex with his partner, Arthur, despite mutual “enthusiastic affairs”. In 1937 they opened the East Anglican School of Painting, where Lucian Freud was a student. Wonderful exhibit at Garden Museum in London. Chelsea Flower Show is divine! Honored to be one of ten photographers awarded an exhibition wall. Come say hello in the Grand Pavilion. UPDATE: The Royal Horticultural Society awarded ‘Dispersal’ a silver-gilt award. With no disrespect to my specimens: Centaurea orientalis debuts as “Mr. President Goes to Seed”, on exhibition in Parody & Art, at the Exhibitionist Hotel, London, 18 May to 25 June. “This group show explores the notion of parody as a visual comment on an original work or idea by means of satiric or ironic imitation.” Curated by Vestalia Chilton of Attollo Art.